According to the Sheffield Star newspaper, the Peak District National Park authority successful took a case to court against developer Mark Boulby. This gentleman apparently cleared a large area of the protected Froggatt Wood in the eastern Peak’s Conservation Area. The damage happened in September 2015 and involved heavy machinery removing trees and doing untold damage to the protected environment here. 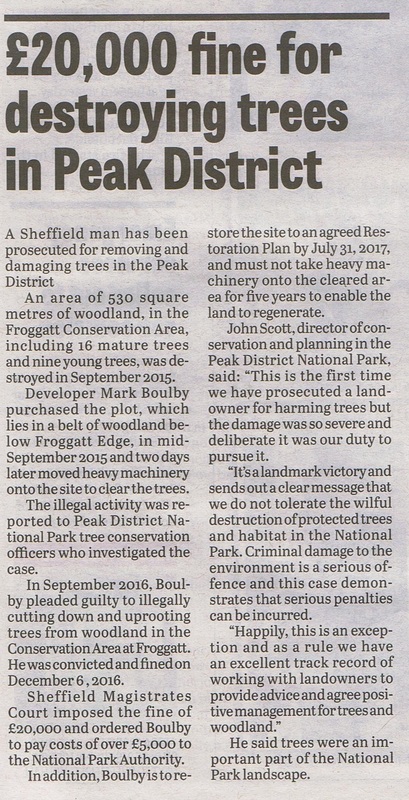 Following the successful prosecution brought by the Park’s tree conservation officers, a fine of £20,000 was imposed by Sheffield Magistrates’ Court. Had SCC bothered to value their street trees and perhaps even TPO them, as some other Local Authorities have, they would be able to fine Amey even more than the £2m+ that they fined them in 2015. The damage and destruction associated with TOTAL disregard for current good practice* when undertaking works in close proximity to trees, and to trees, could be worth millions of pounds. Food and Agriculture Organization of the United Nations: Salbitano, F; Borelli, S; Conigliaro, M; Chen, Y, 2016. FAO Forestry Paper 178: Guidelines on urban and peri-urban forestry. Rome: Food and Agriculture Organization of the United Nations. The British Standards Institution, 2010. British Standard 3998:2010 Tree Work – Recommendations. London: BSI Standards Ltd. The British Standards Institution, 2012. British Standard 5837:2012 Trees in Relation to Design, Demolition and Construction – Recommendations”. London: BSI Standards Ltd. The British Standards Institution, 2014. British Standard 8545:2014 Trees: From Nursery to Independence in the Landscape – Recommendations, London: BSI Standards Ltd.
http://www.njug.org.uk/publications/ [Accessed 20 March 2014]. http://www.ukroadsliaisongroup.org/en/utilities/document-summary.cfm?docid=C7214A5B-66E1-4994-AA7FBAC360DC5CC7 [Accessed 23 June 2015]. http://www.tdag.org.uk/trees-in-the-townscape.html [Accessed 27 June 2012]. http://www.tdag.org.uk/trees-in-hard-landscapes.html [Accessed 25 January 2015]. Note: although Roads Liaison Group guidance was revised in October 2015, there is a period of grace for local authorities to adjust to the changes. It covers the Core Investment Period for the £2.2bn city-wide Streets Ahead highway maintenance PFI project. As SCC neglected to comply with the previous guidance (mentioned above), getting them to comply with that would be a good start. At the Inaugural Highway Trees Advisory Forum (HTAF) meeting, on 23rd July, 2015, Ms Louise Wilcokson, representing SORT, read out paragraph 9.6.4 from WELL-MAINTAINED HIGHWAYS – CODE OF PRACTICE. The disgraced Steve Robinson* (SCC’s Head of Highway Maintenance – TOTALLY responsible for the all felling decisions) listened VERY closely and paid great attention. It was clear, from his facial expressions and mannerisms, that he was not familiar with this content. He was unprepared for it and did not respond to it. “MR CAULFIELD RECENTLY LEFT SCC TO TAKE UP A NEW POST”. THIS HAS NOT BEEN PUBLICISED. THE DISGRACED STEVE ROBINSON IS NOW AGAIN RESPONSIBLE FOR HIGHWAY TREES. Note: UK Roads Liaison Group guidance was revised in October 2016, NOT 2015. UK Roads Liaison Group guidance was revised in October 2016, NOT 2015. The letter below (unedited version), dated Tuesday 29th November, 2016, was published in The Star on 9th December 2016 – “City Tree Destruction” (the final sentence in the published version was edited by The Star). The quote from the Roads Liaison Group is from the 2016 guidance. In time, it will supersede the version quoted previously by SORT (see above). When Sheffield’s £2.2bn “Streets Ahead” highway maintenance PFI project began, in 2012, mature trees accounted for 73.8% of all highway trees in the city. Most are associated with damage to footways and kerbs and, consequently, scheduled for felling. Prior to the project, Sheffield City Council (SCC) relied on section 58 of the Highways Act as a defence for not undertaking works, due to insufficient funding. “THE UK FORESTRY STANDARD: The governments’ approach to sustainable forest management” defines and requires the sustainable management of street trees, as part of the urban forest. Last month, the United Nations also officially recognised street trees as such and added: “URBAN FORESTS ARE THE BACKBONE OF THE GREEN INFRASTRUCTURE” (FAO Forestry Paper 178). TREES AND ASSOCIATED BENEFITS CAN AND SHOULD BE VALUED AND RETAINED. Perhaps the £2m plus that SCC fined Amey last year could be used to this end? WE STRONGLY BELIEVE IN THE CONCEPT OF AN URBAN FOREST and we fully support initiatives such as The Outdoor City that fundamentally depend on Sheffield’s richly treed urban environment. This is the result of forward-looking city plans from the early 20th Century that anticipate the modern concept of ‘GREEN INFRASTRUCTURE’, and from intensive street tree planting from the middle of the 19th Century to the middle of the 20th Century. This has resulted in an unrivalled legacy to current and future generations. The Sheffield Trees and Woodlands Strategy 2016-2030 offers a unique opportunity to demonstrate innovation in how the city measures and values the benefits of its trees, that go well beyond short-term economic considerations. On-going research in the Department supports the valuable contribution that trees and woodland can make to human health and well-being, cooling the city, attenuating flood waters and providing habitats for a wide range of flora and fauna. Student design and planning projects throughout all student cohorts in the Department serve as testing grounds for innovative uses for trees across a wide range of real sites in the city. And PhD and Masters theses explore the extent and breadth of ECOSYSTEM BENEFITS that trees bring to the city, and to the tangible and intangible cultural benefits. This research shows that Sheffield residents VALUE STREET TREES highly. Sheffield Landscape BLOG. December 21, 2016. Glad this was actioned, though £1 million + would have been a more appropriate fine for this, along with a lengthy prison sentence and some sort of compulsory, unpaid reacquisition of the land by the Park authority along with compensation to any neighbouring farms/properties, rambler groups commensurate with the personal assault on their surroundings that this criminal activity entailed.